Vietnamese National Assembly Chairman Nguyen Phu Trong had a busy day on March 17 during his trip to Japan, starting with a meeting with Japanese Emperor Akihito and Empress Michiko. 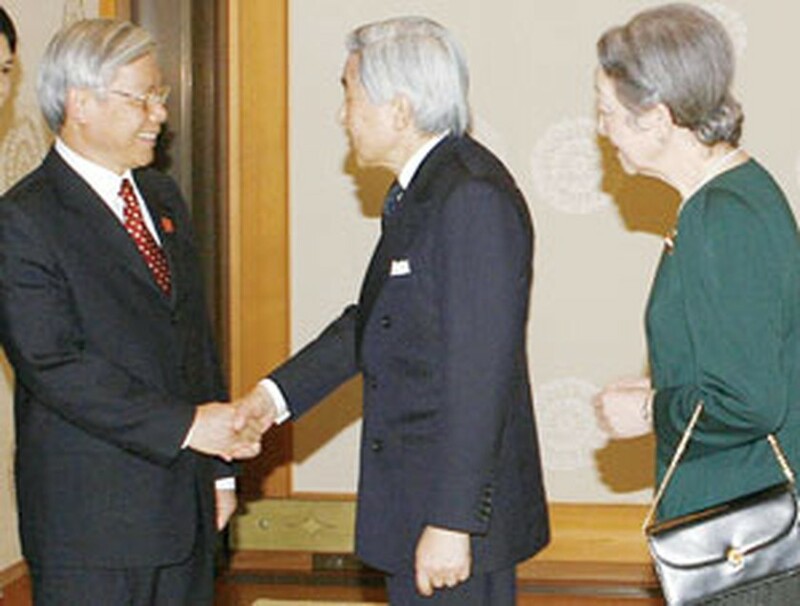 Japanese Emperor Akihito (C) and Empress Michiko welcome Mr. Nguyen Phu Trong in Japan. The legislative leader conveyed to the Emperor and Empress the best regards from Vietnamese President Nguyen Minh Triet and expressed hopes to receive the royal couple in Viet Nam as soon as possible. Emperor Akihito hailed Chairman Trong’s visit at a time when the two countries have been enjoying developments in their relationship and the two peoples are conducting various activities to mark the 35th bilateral diplomatic ties. He congratulated Viet Nam on its socio-economic achievements and improvements in people’s living conditions, while offering deep sympathy to farmers hit by a record cold spell recently. The Emperor pointed to cultural similarities shared by the two countries, saying these serve as a firm foundation for the two countries’ ties to grow in a long-term and sustainable manner. Later Mr. Trong and his entourage met Chairman of the Japanese Communist Party Kazuo Shii. The Japanese communist leader said he was glad with the developments in friendship and cooperation between the two countries and the two communist parties. 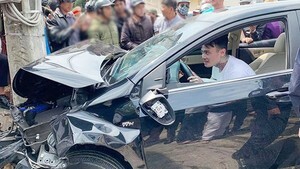 He praised Viet Nam’s successes in developing a socialist-oriented market economy, reducing poverty, raising the people’s living standards, expanding external ties and promoting its role in the region and the world. “The Vietnamese National Assembly is operating actively, making practical contribution to promoting democracy in Viet Nam,” said Shii. Chairman Trong congratulated the Japanese Communist Party for what it has gained in the past time, particularly in party building work. He expressed gratitude to Japanese communists for providing Vietnamese people with unceasing support and solidarity throughout their revolutionary course. At a meeting the same day with the Chairman of the Liberal Democratic Party (LDP)’s Policy Research Council, Diet member Nikai, Chairman Trong appreciated the LDP for promoting Japan’s assistance to Viet Nam’s projects on the building of north-south express railway and highway and the Hoa Lac hi-tech park. The Vietnamese NA will actively work to speed up the implementation of cooperative projects between the two countries, Chairman Trong said and asked the LDP official to continue to help promote bilateral friendship and cooperation. In the meeting with the Japan Federation of Economic Organizations (Keidanren) President Fujito Mitarai, Chairman Trong said he valued the federation’s role in boosting the two countries’ cooperation and investment. “Bilateral multi-faceted cooperation has brought in practical benefit to Viet Nam,” Chairman Trong noted, expressing his expectations that Keidanren will do more to encourage Japanese businesspeople to increase investment in Viet Nam. Chairman Trong also met with Sumitomo Chairman Oka Motoyuki and Vice Chairman of Nomura group Toda Hiroshi and representatives of the overseas Vietnamese community in Japan.